Can DSPs help more people with disabilities find good jobs with the right training? Not many people with disabilities have jobs, but many want to work. We think that if DSPs had the right training, they could help more people with disabilities find good jobs. We want to know if the right training helped DSPs help people with disabilities find good jobs. Step 1: DSPs said they helped about 5 people find jobs in the past year. Step 2: Then we gave DSPs training on the best ways to help people with disabilities get good jobs. DSPs need to know what you like to do. DSPs need to know what things you are good at doing. DSPs need to talk to your family and friends. DSPs need to spend time with you at work and other places in the community. DSPs learned how to find jobs. DSPs learned how to talk to employers about making jobs for you. DSPs learned how to match you with the right job. DSPs learned to tell employers about your support needs. DSPs learned to help you and the employer have a good relationship. Step 3: One year after the training, we asked DSPs to tell us how many people with disabilities they helped find good jobs. 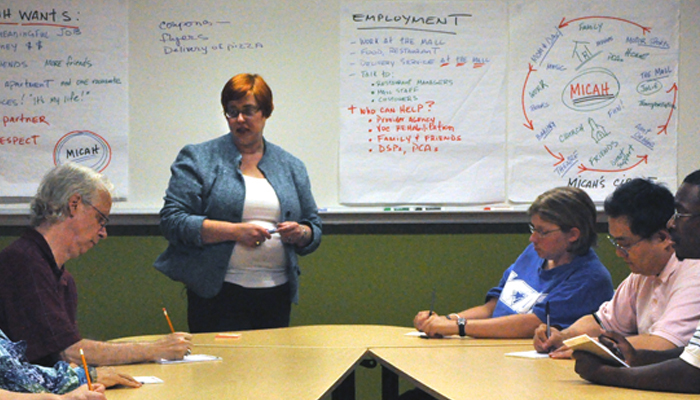 Before the training, DSPs helped 5 people with disabilities find jobs. One year after the training, DSPs helped 7 people with disabilities find jobs. Yes! With the right training, DSPs can help more people with disabilites find good jobs. A DSP can also work to get a special credential in employment. It’s called DSP-Specialist-Employment Supports. Where can I find information about the training used in this research? Migliore, A., Butterworth, J., Nord, D., & Gelb, A. (2011). Improving job development through training and mentorship. Research to Practice Brief, Issue No. 51. Boston, MA: University of Massachusetts Boston, Institute for Community Inclusion.